Christi Friesen Book 3 "Under the Sea"
Home / Christi Friesen Book 3 "Under the Sea"
Oceans of fun are in store for you in the pages of Under The Sea, the third book in Christi Friesen's Beyond Projects series. This is a how-to book with more! --more photos, more descriptions, more tips, more inspired hints to help stir up your creativity. This book will make sculpting with polymer clay more fun, no matter what your skill level. 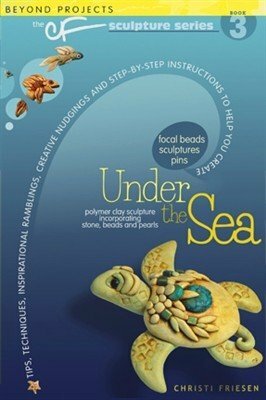 In this book, you will swim your way through creating sea turtles, fish, sea horses, starfish and a myriad of other ocean fun. The emphasis is on color, composition and creativity, but the real treat is in seeing how to add embellishments of pearls, semi-precious stones, shells and beads to your creations. Under The Sea is swell!